No rain! Chrysler was in town for their annual Spring fling thingy so they showed up with a full row of recent Dodge and Chrysler show cars and production versions of the new Charger, Challenger SRT 462 and 300. The 300 really looks nice with its less-square corners and new style grille, and the Charger is just screamin' out for a big ol' "01" on the door and a Confederate flag on the roof. SEMA tuners, you have your orders. Not to be outdone, Porsche brought over two RS models - the wicked quick, track-focused GT3 RS, and the even more insane, turbocharged GT2 RS. With 620 hp under the rear lid it is the most powerful road-going Porsche ever. This is the car that Porsche-expert/photographer/videographer/racer Jeff Zwart will be tackling Pike's Peak in this year, aiming to better his rear-drive production car record. For good measure he even brought his 906 today. This is quite possible the lowest car to ever show up at C & C.
And speaking of classics, teenage fantasy cars were littered throughout the lot today. Front and center sat Tony Noble's Lamborghini Countach 5000S droolmobile. Everything about this car is excessive, and awesome. The rear tires are 345/35-15s, which means the wheels are practically square. Need I say more? An F40 and Testarossa slipped into the back corner, and a quick cruise up and down the aisles uncovered other high school dream cars like the Lotus Esprit, Ferrari 355, Lancia Scorpion, Audi Coupe Quattro, Corvette, 911, etc., etc. One of the most fun cars at the show today was the Ford Focus V8. I can't speak to its handling or performance, but gosh you have to admire the kind of ingenuity it takes to pull something like that off. If you've ever wondered what the payoff is in getting to Cars & Coffee at oh-dark-thirty, this morning was a perfect demonstration. Sneaking in under the cover of darkness, the McLaren MP4-12C showed up with a handful of McLaren reps attending to it and an additional rolling chassis that perfectly shows off the new supercar's advanced lightweight construction. While the car has been criticized a bit for its somewhat safe and uninspiring styling, nobody can argue with its stats. This 592-hp missile has been burning up the track, posting 0-60 and quarter mile times within spitting distance of its legendary ancestor, the F1. The new Macca's closest competitors on paper are probably the Ferrari 458 Italia and Lamborghini LP570-4 Superleggera, and although those cars seem to cut a more dashing figure, the Brit cuts and dashes better than either and takes no prisoners on the track. Only a few cars can break into the 10s in the quarter mile straight off the showroom floor, and this is one of them. 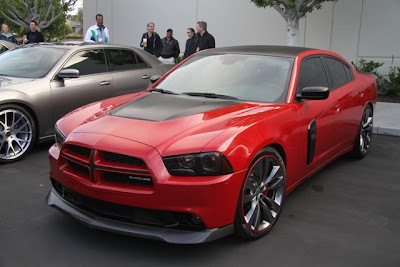 The Porsche 911 Turbo S, Bugatti Veyron and – on a good day – the 2012 Nissan GT-R are the others. While the MP4-12C's top speed of 205 mph won't rival the Veyron's insane 250-plus figure, the car's starting price of $231,400 is roughly a tenth of the big Bug's. It's also right in the same ballpark as its two aforementioned Italian rivals. So for similar money, a buyer could have either of the more established – and arguably sexier – Italians and give up a bit of performance, or opt for this new super sportscar from a well-known racing name that is just getting into the whole production car game, and clean their clocks at the next track day. We say why not just get one of each. Oh, I also remember a Lusso, Triumph, Beetle, pit bull, BMW, Porsche, Ferrari, Lotus 7, another BMW, another Porsche, another BMW...and a few others. The new Ferrari GTO still impresses mightily and I never tire of the wonderfully eclectic mix of participants that ranges from an Ariel Atom to an MG TC, from a Dino to a lead sled, from a Bentley to a Sunny. One of the best sleepers was the old Mercury wagon with the NASCAR rims and lumpy idle that tells us Cale Yarborough's shop might be missing an engine. And on the fifth day, God said "Let there be sunshine," and there was and it pleased the car nuts. Okay, maybe that's not exactly the way the folks who wrote the best selling book of all time put it, but on this fifth day of March, in the year of our Lord two-thousand, eleven, we did finally have light instead of rain and it pleased several hundred car enthusiasts. After getting rained out the last two weekends it was nice to be back in Irvine for a change this Saturday, watching all of the cars, bikes, trucks, vans and people illuminating the automotive passion in all of us. The featured marque was De Tomaso, which meant there were about 50 Panteras in the corral. Everything from early "pre-L" cars to the later GT5 and GTS flared and bespoilered monsters. Some joked that this might have been every surviving - and running - example of the breed, but say what you will - these cars still attract a lot of attention. And really, what's not to like? A mid-engine Italian wedge with Ford power that sold at Lincoln-Mercury dealerships for about 50 percent more than a contemporary Corvette, but half of what you'd have to pay for anything else from Italy with 300 hp. 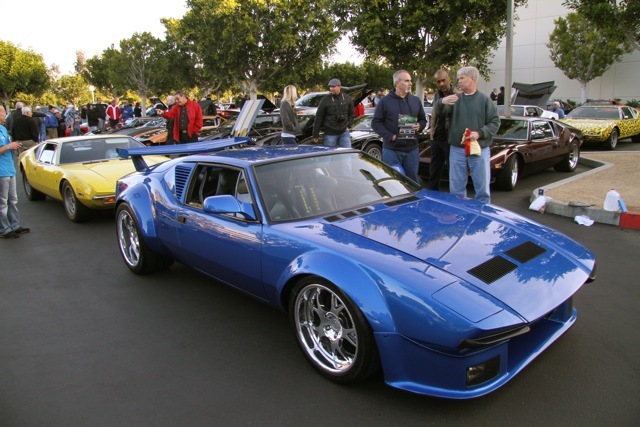 Some five or six thousand (depending on who you ask) Panteras were sold between 1971 and 1975 when Ford officially stopped importing them, but Panteras found their way over all the way until 1992 when they were finally put out to pasture. Wandering out beyond the corral you could see the usual wide array of sports cars, motorcycles, hot rods, muscle cars and just plain weird stuff. The Renaultsport Clio V6 was back in all its puffed up glory, and we saw things like a VW Type 31 Notchback with a giant turbo sticking out its rump, a sextet of Saab Sonnets, a slammed Miata that apparently had rubber fenders to provide moveable clearance for its oddly angled wheels, a Lotus Exige with a rear diffuser that would make a Zamboni envious, an Iso Griffo, Rivolta and... Moto, Subaru SVX, an apparently handmade Ariel Atom clone, the new Mini Oxymoron, the new Kia Optima bulldozer and on and on. For fans of more "conventional" fare... there were plenty of NSXes, Ferraris, Corvettes, Beetles, Jags, Benzes and Porsches. And speaking of Porsches...there were no fewer than three 997 GT3 RS models, a 996 GT2, 997 GT2, lots of Turbos including a 997 Turbo S Cab, and, oh...a new GT2 RS. It's the first one that's been to the show since the car made its U.S. debut back in November at the L.A. Auto Show. On the other end of the spectrum there was a Chevy Cruze parked amidst the real cars, and somehow a group of Chrysler Crossfires slipped in along with a handful of Pontiac Solstice and Saturn Sky roadsters. Oh, there was also a Geo Metro taking up precious real estate in the back corner of the overflowing lot and an old Caddy taking up two spots unnecessarily. Please people, use better judgement.